Pendleton Ward, the creator of Adventure Time, has a new bi-weekly cartoon Bravest Warriors. This is a humorous take on the next gen hero team made up of the children. Remember the comic Gen 13? It’s the same basic concept. You start off with the parents being called for help but the kids pick up and explain their parents are missing. That is when you are introduced to the Bravest Warriors. Each episode is a series of seemingly unrelated events, just like in Adventure Time. There are threads running through each episode though that are building up to season two, so pay attention. I love Pendleton Ward. I have watched all of Adventure Time and last night watched season one of Bravest Warriors in one sitting. The episodes are only five minutes long but somehow tell a good story in each one. Most of the voice actors from Adventure Time are back. He’s added some interesting support characters like paralyzed Horse, Cat Bug and Wankershims. Paralyzed Horse is paralyzed because he realized the meaning of the universe. Wankershims is a holographic elf that moves out of the Holo John and into the real world. Then everything becomes one with Wankershims. Cat Bug is an adorable, child like side kick that can move between our realm and the shadow zone. These odd side kicks help our heroes escape improbable situations. There is a romance story line of course. Beth and Chris are best friends and can’t come to grips with their attraction for each other. Classic Pendleton Ward romantic tension. It’s a very solid show. Check it out on YouTube. If anyone figures out the easter egg in each episode, don’t tell me. 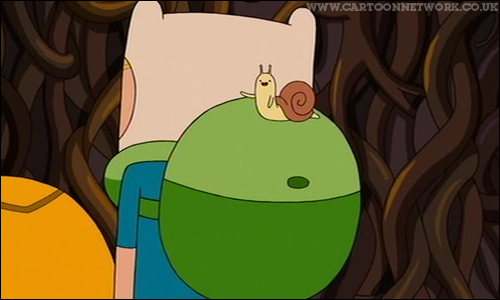 In Adventure time there was a tiny snail in every episode.